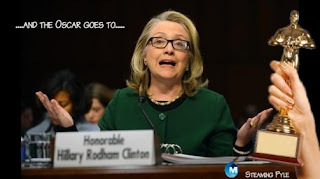 There is a growing disconnect between Hillary Clinton’s public statements following the Benghazi terror attack and what was being communicated in private. New information reveals that the State Department not only knew that the attack had nothing to do with a video, but that officials were specifically cautioned to stay clear of that false narrative. During her testimony before the Benghazi committee, she blamed the contradictions between public and private communications as the result of “conflicting information we were trying to make sense of.” But, a breakdown of internal communications shows that there was a clear understanding that the video had nothing to do with the Benghazi attack. See below for a timeline of exchanges and disclosures that reveal the disparity between Clinton’s public comments and private understanding of events in Benghazi. In an email to the Libyan President: “Ansar as-Sharia [sic] is claiming responsibility.” No reference of video. In an Official Statement by the State Department: “Some have sought to justify this vicious behavior as a response to inflammatory material posted on the Internet.” No mention of terrorists or planned attack. In an email to her family she said, “an Al Queda-like group” was responsible for the attack. No reference of video. During public remarks, “Some have sought to justify this vicious behavior, along with the protest that took place at our Embassy in Cairo yesterday, as a response to inflammatory material posted on the Internet.” No mention of terrorists or planned attack. These developments raise new questions about whether Hillary Clinton and the Obama White House knowingly mislead the American people and the families of the victims. What is clear is that Clinton's excuses don't add up. Related: The Complete Benghazi Timeline. In his testimony before the House Committe chaired by Darrell Issa, Gregory Hicks (Deputy to Ambassador Stevens) testified that he personally talked with Hillary at 2:00 pm Tripoli time which was 8:00 pm Wahington, DC, and told her that Ambassador Stevens had called him from the Safe Room of the Benghazi Consulate to say the Consulate was under attack. When asked about how he felt when he heard about Susan Rice blaming the video, Hicks replied, "I was stunned. My jaw dropped. And, I was embarrassed."